"Whatever SYRIZA’s failings may be, they reflect the failings of the entire European left, of each and every one of us." 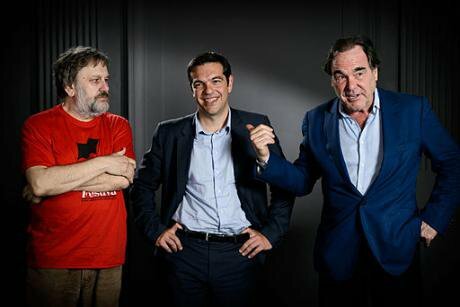 Slavoj Žižek, Alexis Tsipras and Oliver Stone on Subversive Festival 2013 in Zagreb. Wikicommons/Robert Crc.Some rights reservedOn September 20, in spite of the low (and perfectly understandable) low voter turnout, Alexis Tsipras secured another victory by a relatively large majority, following which he announced his plans for a SYRIZA-ANEL coalition 2.0. Unlike the first time round, though, he will do so with the support of a much more united (for now) party, since the anti-euro leftist minority has broken away from the party to form Popular Unity, which failed to win a single seat in parliament. SYRIZA’s victory is, of course, great news: the survival of the only leftist and anti-neoliberal government on the continent is a hugely important event, in light of the European political-financial oligarchy’s numerous attempts to topple it, including a brutal strategy of financial asphyxiation for which the ECB will one day have to answer (both legally and politically). That said, there’s no sense in denying that this is also a bitter victory: we all know that the government’s manoeuvring room is severely limited by the third Memorandum of Understanding’s (MoU) numerous red lines. These elections took place in what is effectively a regime of ‘limited sovereignty’ – a condition that to a lesser degree applies to all EMU countries, meaning that the issue at stake was not the continuation or otherwise of austerity (as SYRIZA, somewhat naïvely, framed it in the January elections), but simply the methods of administration and distribution across society of the austerity measures. At the same time, it would be absurd (and rather infantile in Lenin’s sense of the word) to draw the conclusion from this – as many on the European left have done in recent weeks – that the elections were meaningless, that it made no difference whether SYRIZA or the country’s conservative right came to power, since ‘Greece’s fate is already written elsewhere’ (meaning Brussels, Frankfurt and Berlin). Firstly, it would be naïve to assume that Greece’s fate is really carved in stone in the pages of the MoU. The Memorandum – like every political agreement – is only as strong as the political-economic status quo that sustains it. If the status quo were to change, the MoU’s legitimacy would change accordingly. Need I remind all those who imply a kind of Fukuyama-esque ‘end of history’ scenario for Greece and for Europe that these dramatic events are part of a wider historical process, in which there are no easy shortcuts (‘exit, devalue, live happily every after’), for which the ending has yet to be written? A process in which we are – could/should be – all active participants, not merely spectators? Secondly, because there is some room for manoeuver, albeit very limited. During the negotiations with the troika, Tsipras (along with Varoufakis, in the first stages of the negotiation) fought unwaveringly to obtain a redistribution of the burden of austerity from the lower-middle classes to the upper classes. Sure, the troika met few, if any, of his demands, but – unlike the PASOK-New Democracy comprador duopoly – he fought, and we can expect him to keep fighting throughout this second term. This is not to suggest in any way that, in the current European context, one can entertain the dangerous notion of a ‘left-wing austerity’ in contrast to the establishment’s ‘right-wing austerity’: the logic of the MoU is macroeconomically unsustainable and destined to fail in the medium run, as Tsipras is undoubtedly well aware. This has to be stated in the clearest possible terms. At the same time, it would be intellectually dishonest to argue that, in the short term, there is simply no way of mitigating the suffering of the weakest strata of the Greek population even within the framework of the Memorandum. This is simply not true. In other words, it makes a big difference whether the Memorandum is implemented by SYRIZA or by New Democracy. A point of which the Greeks – more so than those on the non-Greek left, apparently – seem to be well aware. Need I remind the swelling ranks of armchair revolutionaries that Tsipras’ government fought an incredibly fierce and brutal battle against some of the most powerful states and institutions in the world, utterly isolated – European social democracy looked the other way, where it did not actively oppose the Greek government, while social movements were unable to influence the proceedings in any meaningful way – and in conditions of mind-boggling political and psychological pressure (The Guardian wrote that during the 26-hour-long European Council of July 12, Tsipras was subjected to ‘mental waterboarding’ in closed-door meetings with Angela Merkel, Donald Tusk and Francois Hollande). Despite this, the Greek prime minister kept his nerves, dignity and determination, obtaining the most that a government of a small, weak (albeit proud) nation, elected on the basis of a very moderate social-democratic platform, could obtain via diplomatic means, in light of the historical circumstances (i.e., the level of class struggle in Greece and, more importantly, the brutal power relations on which the current European order rests). In other words, whatever SYRIZA’s failings may be, they reflect the failings of the entire European left, of each and every one of us. Does this means that there was no alternative to a third Memorandum? No, but we should be clear about the fact that the only possible alternative was a Greek exit from the eurozone (the argument that there existed a ‘third way’ in which Greece remained in the EMU while issuing a parallel currency is very weak, at best). In the end, though, Tsipras ruled out a return to the drachma. Was it a mistake, as many on the left – including many of Tsipras’ former comrades – argue? I beg to differ. The point is not that Tsipras didn’t have the mandate to take Greece out of the euro (which he didn’t), nor that countries should cling to the euro at all costs (God forbid). The point is that, given the circumstances, none of the conditions that would have been necessary to mitigate the otherwise disastrous effects of an exit were present, neither at the national level – lack of a level of mobilisation and radicalisation of the workforce and general population capable of sustaining the necessarily-traumatic-at-first consequences of an exit, the chasm between SYRIZA’s electoral success and its grassroots support, the weakness of the Greek productive fabric, the country’s chronic current account deficit, etc. – nor at the international level, with neither China, Russia or the United States showing a willingness to offer the country financial support. Tsipras admitted his defeat in the face of the troika, acknowledging that the terms of the new Memorandum are very harsh, but also correctly noted that the alternative – solitary exit from the EMU or, even worse, expulsion at the hands of Schäuble – would have been far worse. The point, as Italian political scientist Michele Nobile writes, is that ‘the limits of the Tsipras government are the limits of the current state of class struggle, not only in Greece but in all of Europe’. But the responsibility of shifting the balance of power in Greece and in Europe – between classes as well as between countries – cannot rest solely on the shoulders of Tsipras, as the angry calls for Grexit coming from all quarters of the European left seem to imply. As the Greek writer Alex Andreou commented: ‘It is revealing of the political landscape in Europe – indeed, the world – that everyone’s dreams of socialism seemed to rest on the shoulders of the young prime minister of a small country. There seemed to be a fervent, irrational, almost evangelical belief that a tiny country, drowning in debt, gasping for liquidity, would somehow (and that somehow is never specified) defeat global capitalism, armed only with sticks and rocks’. Indeed. Especially when we take into account – as Nobile points out – that the problem of the balance of power in Europe is further complicated by another issue: ‘on the one side, the post-democratic regression of national political regimes; on the other, the institutional design of the European Union and monetary union, which constitutionalises post-democracy at a much higher level. This faces us with an unprecedented situation, which doubles the challenges posed by a leftist electoral victory: it is not simply the struggle against the national apparatus of the capitalist state that one has to take into account but also that against a higher-level apparatus, which incorporates the lower level in a supranational or inter-state system’. To which I would add that this ‘supranational or inter-state system’ extends its reach well beyond the boundaries of the EU/EMU. To believe that exit from the EU, EMU or both is sufficient to escape the fury of the European and international predatory oligarchy would be to seriously delude oneself. For the establishment, it is crucial to prove that no alternative to neoliberalism can exist neither within nor without the eurozone. To conclude, I think we should all be grateful to SYRIZA for kick-starting a new political cycle in Europe (evident also in Jeremy Corbyn’s election as leader of the Labour Party in the UK), but we should also be aware that there is only so much that SYRIZA can do alone. It is only by means of a resolute pan-European class struggle, fought at both the grassroots and institutional/governmental level and coordinated at the continental level – the same level at which capital operates –, that we have any hope of overturning the current economic paradigm. Today more than ever it is crucial to understand that the challenges posed by the crisis and by post-democracy cannot be solved within the boundaries of individual member states (inside or outside the euro); they necessarily have to be addressed in the context of a transnational transformative framework (inside or outside the euro). Anything less than that is almost invariably bound to fail.